It's an easy way to obtain revenue. People have to eat. And unless they grow and raise most of their own food, they will be shopping at your local grocery. The New Mexico Municipal League (NMML), the group that advocates for our cities in the state legislature, is looking for a way to compensate for the loss of state subsidies without having to raise local base tax rates. According to NMML Executive Director Bill Fulginiti, the proposal to impose the tax on groceries has nearly unanimous support from municipal leaders across the state, presumably Mayors Richard Berry of Albuquerque, David Coss of Santa Fe and Ken Miyagashima of Las Cruces. Read more in Albuquerque Journal. Another attempt to reimpose the food tax was defeated in 2013. Gov. Susana Martinez also opposes the food tax, primarily because it helps her keep her campaign commitment not to raise any sort of taxes. 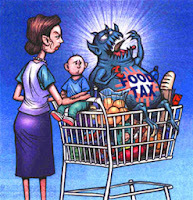 “The governor does not support the reimposition of the food tax,” Martinez spokesman Enrique Knell said this week. Think New Mexico, an organization that worked to remove the food tax in 2004,has fought every effort to reimpose the levy on groceries. The Santa Fe-based organiation is keeping an eye on the latest situation. Think New Mexico wrote a comprehensive policy report in 2001 pointing out why a tax on food is bad idea. Stay tuned for updates from Think New Mexico on the latest effort to reimpose the Food Tax. Think New Mexico is also being proactive about the economic situation in our state. The organization has launched a new policy reform initiative designed to address our state's urgent jobs crisis, which has left 137,000 New Mexicans unemployed or underemployed. So, having said no to the food tax, the question now is how we help municipalities make up for the reduction in state revenues? The loss of revenues means that some essential services wouldl have to be cut. That is an issue that cannot be swept under the rug, and one that legislators will have to consider seriously. Tax Gas, not Food. It's Simple.